Whether or not you're able to attend the sold-out SCBWI Summer Conference that starts this Friday, you can be part of the online river of information and inspiration by visiting The Official SCBWI Conference Blog and following our conference hashtag, #la14scbwi, on twitter. Oh, and by watching videos like the one above! Featuring conference faculty, including Golden Kite Award-Winner for Fiction Tim Federle and Agent Danielle Smith, I have the honor of hosting this informal gathering to discuss LGBTQ publishing, the submission process, and answer your questions about this vital corner of the market for young readers. Hosted by by Lamar Giles and Meg Medina! And, of course, keynotes, main-room panels and breakout sessions featuring our conference faculty - a diverse group of authors, illustrators and children's literature industry professionals! 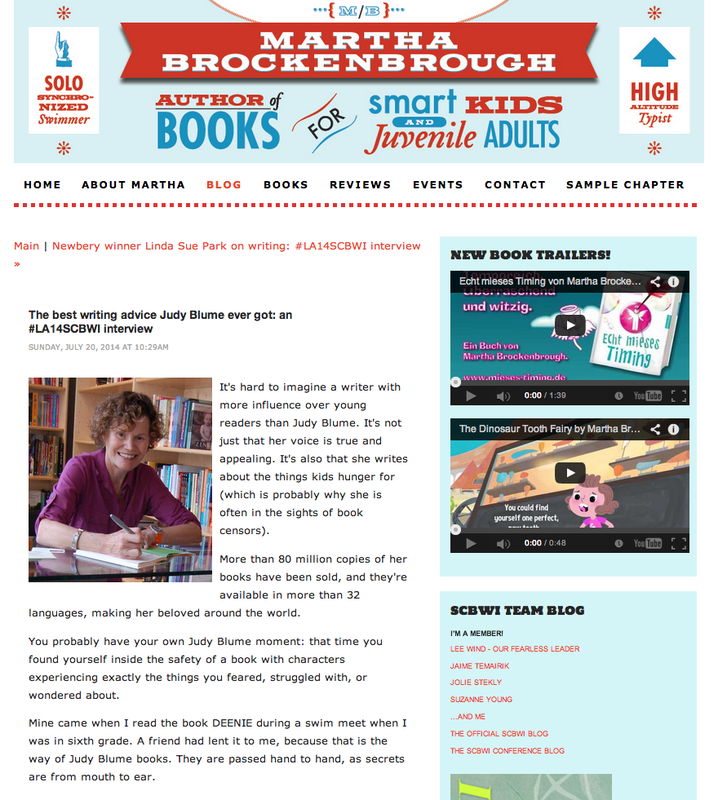 Here's the interview, where you can read Judy's advice on getting past the moments when she wanted to quit writing, and hear the best writing advice she ever got! Thanks Judy, and thanks Martha! 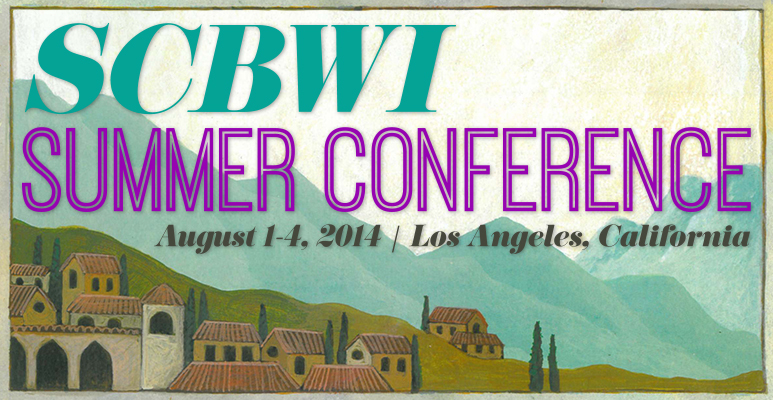 While the 2014 SCBWI Summer Conference is sold out, make sure to check out this conference blog and our conference twitter feed (at #LA14SCBWI) for highlights and a tapas-like taste of all the inspiration, craft, business, opportunity and community! 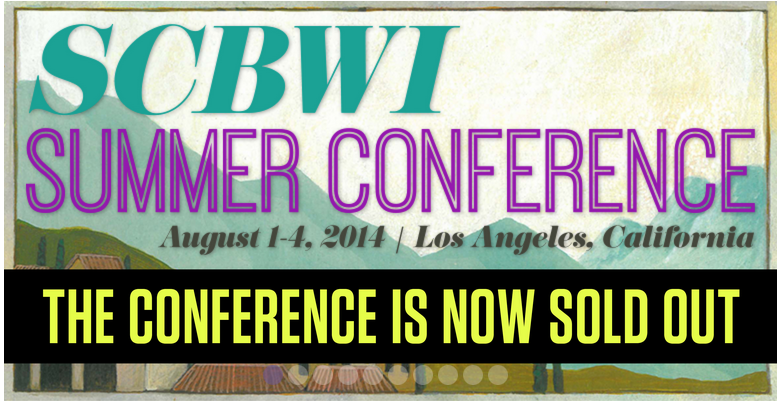 #LA14SCBWI - The 2014 SCBWI Summer Conference - Is Sold Out! Here's to an amazing conference ahead! Craft... Business... Inspiration... Opportunity... Community! Workshops (in the tracks: General, Pro, Illustration and Nonfiction), Socials and Peer Critique opportunities. There's the Golden Kite Luncheon, The Tomie dePaola 80th Birthday Bash - A Night In Old Italy, and the Portfolio Showcase. The conference is on the verge of selling out - only a few spaces remain. David Meissner, nonfiction winner for "Call of the Klondike"
Tim Federle, fiction winner for "Better NATE Than Ever"
Peter Brown, illustration winner for "Mr. Tiger Goes Wild"
Pat Zietlow Miller, picture book text winner for "Sophie's Squash"
Bill Konigsberg, Sid Fleischman Humor Award Winner for "Openly Straight"
It's going to be an awesome conference - but if you want to join us, you'll need to act fast. You can find conference details and registration here. Check out this plot-centered discussion Team Blog's Jolie Stekly had with Executive Editor (and author) Jill Santopolo! Jill goes into detail on what you can expect from attending her 3 hour plot intensive, and she'll also be teaching two general sessions during the main summer conference, "20 master plots: go on a story brainstorming binge" on Friday afternoon and "In the hot seat: embodying your character with tricks from the theater"on Sunday morning. If you want to be there to learn from Jill yourself, you'll need to join us at the SCBWI Summer Conference, August 1-4, 2014 in Los Angeles. The conference is nearly sold-out, so go here to find out all the details and register! 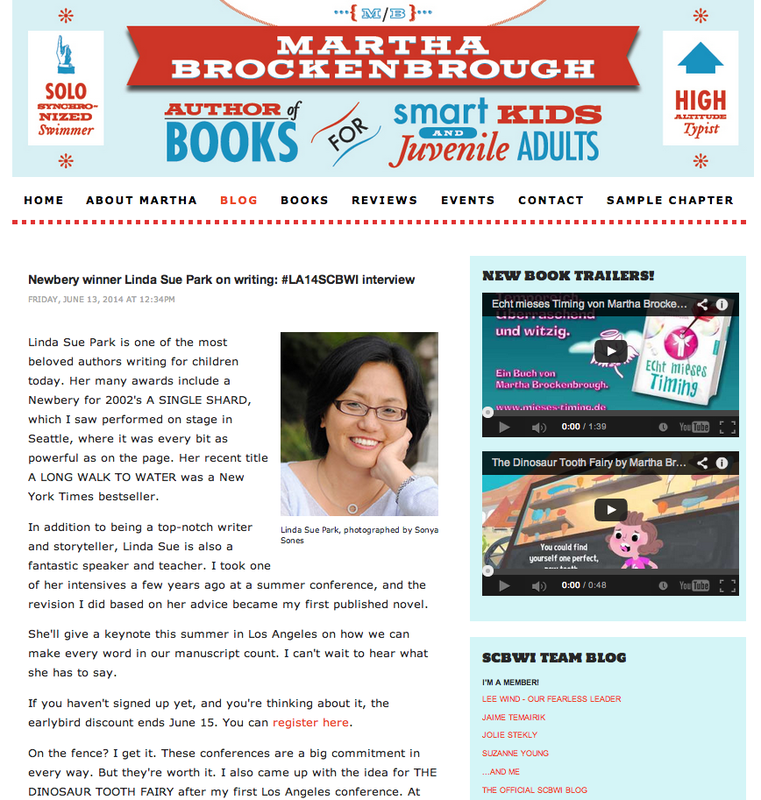 Check out Newbery Award-Winning and Best-Selling Author Linda Sue Park's interview with Team Blog's Martha Brockenbrough. Linda Sue shares how research revs up her engine and tells us about the best piece of writing advice she's ever gotten - and how that's the secret to her process! 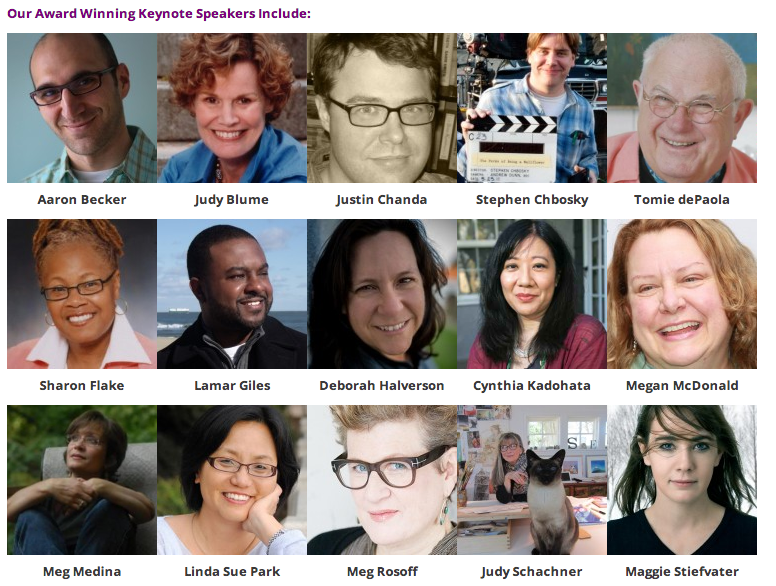 The SCBWI Summer Conference is almost sold-out, but you can still register and be there for all the inspiration, opportunity, business, craft and community it offers! You can find out all the details here.